Holistic Bio Spa is thrilled to have our dear Jaqui Karr share her experience with alternative medical tourism in Mexico. She will be telling us about Glutathione and how this wonderful elixir helps us to remove collective damage from years past and protect us for the years ahead. What’s the point of eating something if your system isn’t absorbing it? That’s why people who think they’re eating healthy and pop 20 vitamins a day still get sick (yeah, I know, you just thought about all the vitamins you have bought over the years…don’t worry, we all have). There’s a monster called “oxidization” that constantly eats away at your health, which in turn ages you faster inside and out. Scientists call it oxidative stress (toxic poisons swimming around in your body looking for what they can destroy). Here’s the sad truth: e-v- e-r- y-o- n-e suffers from oxidative stress. You’re in the club my friend, the Industrialized Toxic World Club. It’s the reason half the world has cancer and the other half are on Prozac. Your health is compromised at a cellular level and throughout your body. People are aging faster, getting sick more, and generally not energetic and happy. What does Glutathione have to do with the fountain of youth? Top immunologists call glutathione the “master antioxidant”. Remember the bad guy called “oxidative stress”? Glutathione is how you beat it. Problem is, what’s the use of popping a pill if it’s not the way to fully (if at all) absorb it? Waste of money. There’s a better way: breathe it in. It’s as simple as this: you get the highest grade of glutathione and put it in a nebulizer (think healthy pipe). Sit there for 15 minutes and just inhale. It goes right into your system. Sniff via the nose and it breaks the “blood-brain barrier” and gets delivered straight to your brain cells, bypassing the digestive system and blood. Pills can’t do that. Think of your cells as a little round ball. They are weak and get sick when exposed, even break. Glutathione is the coating—covering—protecting your cells. When your cells are sick, you are sick. You degenerate and age faster. No bueno. Your brain also doesn’t function well when limping around with damaged cells. Brain fog. Moodiness. Depression. Extra no bueno. Everyone knows about the harm of metal dental fillings, mercury in fish, water with asbestos (this list is too long for my comfort). Metals are the hardest thing to detox. Most protocols take 9-12 months. Seriously, no bueno. Glutathione sticks to metals and flushes them out of your body. While I’m at it, I’ll tell you it also metabolizes toxins and carcinogens (those cancer causing critters) and helps your body get rid of those bad guys too. Your immune system is your only defense against everything. Strengthening your immune system should be a major priority to reverse and prevent illness. Glutathione has sulfur atoms that create better “processing” of proteins (I just saved you a lot of geek talk). Why bother eating high-quality proteins if your body can’t process them? Enzyme Activation and Catalysis. Not only do you absorb proteins properly but it helps your body’s own enzymes come alive. Holy Digestivo (maybe the 75 million Americans with digestive problems need to know this). Do you think it’s important under the Puerto Vallarta sun?! It’s important under any sun.…this is just a partial list! Glutathione reverses damage from yesterday and protects you for tomorrow, making you younger with every inhale. Call or email Holistic Bio-Spa (you’re going to get Ana Cordero – Office Manager Extraordinaire! Forget Mexico time, this lady can give New Yorkers a run for their money when it comes to speed and efficiency). 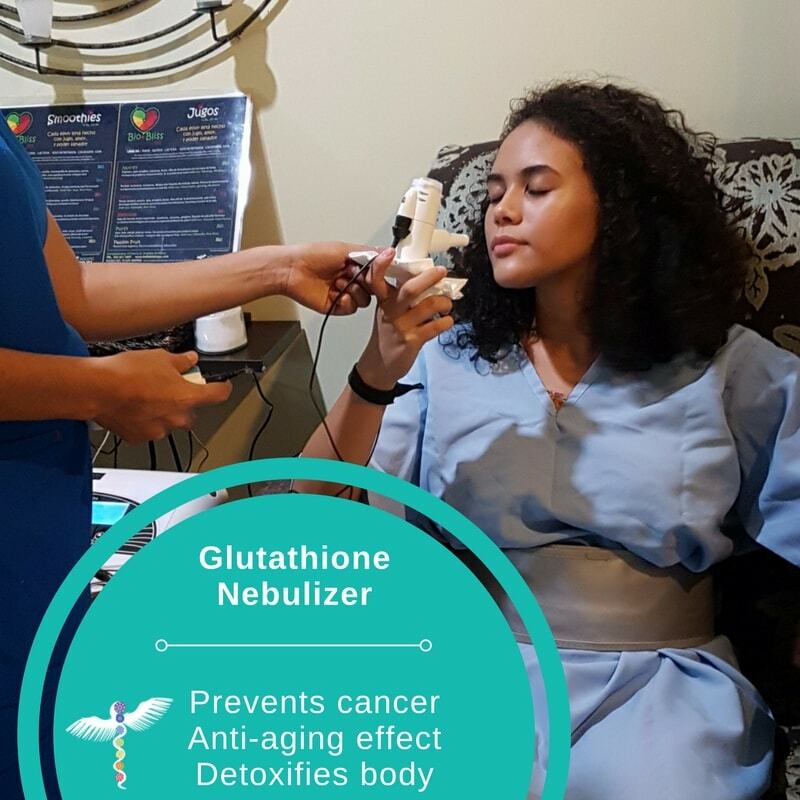 Tell Ana you want the “Jaqui Perfect 10 Package of Glutathione Nebulizer” (awesome savings when you get 10 treatments and it’s extremely inexpensive – not even a fraction of what you have wasted on useless vitamins). P.S. Bonus Benefit: when you do something that focuses on your health in such a huge way (seriously, feeding all the cells in your body and brain, and repairing damage…that’s gigantic) use the time to really appreciate yourself. You’re going to go in 10 times for something easy and relaxing, almost meditative. it’s time for you to just sit still and let your body get stronger. Be mindful and enjoy this powerful gift you give yourself. 2 Responses to "How To Breathe-In The Fountain of Youth: Glutathione"
como puedo conseguir glutathione en rio bravo mexico? Lamentablemente, no conocemos a otro naturopata con glutathione por Rio Bravo. Pero quiza podemos hacertelo llegar por otro medio. Gustas llamarnos al +52 (322) 221 1607 y nos ponemos de acuerdo?